There is no doubt that the relationship between dads and daughters is a special one, and one that is formative to a girl’s growing sense of self and her future relationships. (No pressure, Dad!) So this Father’s Day, celebrate all that is beautiful and goofy about this relationship with these wonderful new picture books about fathers and their little girls. (read my full review). It is a celebration of all the ways that a girl can spend time with her father – riding bikes, swimming, or just relaxing. To me, the underlying message it about unconditional love, as her father’s unwavering support makes the main character feel safe and more sure of herself, and more able to deal with big emotions.
! The cover alone already gives you a hint about where this book will take you! This book takes a familiar disagreement – a child who wants a pet, the parent who says no – to a hilarious extreme, as a girl explores all the ways her dad is (and isn’t) the perfect pet. Kids will love all the silliness as the main character tries to “train” her dad, and parents will notice that she is the one being trained, into asking her father for things nicely! When our oldest son was little, and our bookshelves started to fill with colorful, engaging board books, my husband made an observation that has stuck with me ever since – nearly all of the books focused on the child’s relationship with the mother, but very few included the father. Thankfully this is not universally true, but I was surprised to see how widespread this pattern was. Ever since then, I’ve sought out books that also include the father and especially ones that celebrate their special relationship with their children. And so, in honor of Father’s Day next month, I’m happy to present to you some favorite children’s books that celebrate fathers, plus we have a giveaway for you, so be sure to scroll to the end of the post to enter! Disclosure: I received complimentary copies of some of the books below for review purposes; however, all opinions are my own. This post contains affiliate links. If you click through and make a purchase, I receive a small commission at no extra cost to you. I love the adorable new book Daddy Honk Honk! Set in the Arctic, it is the tale of Aput the fox, who is thrust into fatherhood when an abandoned goose egg hatches and the little gosling mistakes Aput for its daddy. With each page we see Aput’s transformation as he learns to care for the baby but more importantly as his affection for it steadily grows. This is also a beautiful tale of the importance of community in supporting families, as Aput’s friends all help teach him what a baby needs and help surround them both with love. Very sweet tale to share with your little ones! My preschooler and toddler both really enjoy this story. is a cute board book that your kids will love! Like so many young children, Charlie loves getting out and seeing the world using any means possible: trains, boats, bikes, soapbox derby cars, and more! While the main focus on the book is on different modes of transportation, a recurrent element is Charlie’s dad, who is with him every step of the way. This colorful book is a tribute to how fathers nurture children’s curiosity about the world and support them in all their adventures. was a lucky find at the library and has stayed in our regular rotation ever since. It is a funny book that not only teaches appreciation for dads (even when they sometimes get mad or are just totally gross!) but also teaches facts about animals in a really fun way. For example, be glad your dad is not an octopus, because he would always win at tag! My favorite, though, is the tortoise dad – who is so slow getting an ice cream cone that the ice cream actually melts before the kid can eat it! I love the illustrations, especially the kids’ reactions to the animal dads. Cute reminder about why human dads are so cool! More details about the animals can be found at the back of the book. What are your favorite children’s books that celebrate fathers? I am so excited to be hosting a giveaway of Daddy Honk Honk! To enter, simply comment on this post, telling us something you appreciate about a special father in your life. The contest goes until midnight PT on Sunday, May 14. US shipping only. Good luck! Do you have a techie dad on your shopping list this year? Here are some great Father’s Day gifts for them! At the top of my list is the stunning DROID Turbo Sapphire Blue from Motorola. Its display is super sharp, and it has the newest, most powerful processor. And if you are like me and hate having to stop and recharge, the DROID Turbo Sapphire Blue has a 48-hour battery! And because there are little hands around, it’s comforting to know that the phone has water-repellent nano-coating plus Corning Gorilla Glass to help protect it from those inevitable spills and scratches. Oh, and did I mention that underneath the woven materials there is a layer of Kevlar?? Talk about protection! I love how lightweight it is and that it doesn’t look like all the other smart phones: The exterior is made of cutting-edge materials in a rich blue color that will set your phone apart from the rest! So for superior display, speed, and look, go for the DROID Turbo Sapphire Blue from Motorola! Another cool accessory for your phone or camera is this JOBY Gorillapod Flexible Tripod, which comes with a Bonus IVATION Universal Smartphone Tripod Mount Adapter. We have an earlier version, and it is GREAT. It holds your camera or smartphone in just the right position to snap exactly the photo you want. The grip is really strong, so you don’t have to worry about your camera or phone falling out, and the tripod really does attach to any surface! Plus it is so small and lightweight it is easy to throw into your luggage before your next trip! Do you want to make your home more environmentally friendly but don’t know where to begin? Try the Philips Connected Home LED Starter Kit. It’s a great, easy to to save some money (up to 80% energy savings!) and do your part for the planet. Plus, it lets you control the lighting from your smart phone or tablet – even when you’re not home!
. It is a lightweight, easy to use device to track all of your fitness activity. Easy access to real time stats, plus it syncs up wirelessly with your phone and/or computer. Remember, every step counts! And finally, for the dad who has never really grown up, here are some super fun high-tech toys! What dad wouldn’t love to play with this Parrot Mini Drone Jumping Sumo?? Designed to do spins, jumps, and extreme turns, it even comes with a wide angle camera to give a real pilot’s view of the action. And of course, you can even control it from your computer or smart phone!
. It’s even small enough to fly around the office! This drone is the way to go to really impress his buddies: The UDI U818A 6 Axis Gyro RC Quadcopter is easy to install and repair, plus it is very stable and easy to operate though it looks super serious! Happy Father’s Day! How are you celebrating with the big guy in your life? As many of you know, we just returned from a wonderful trip to visit family in Costa Rica. While we were there, we were able to take our little volcano lover to visit two of the active volcanoes in that country, Poás and Irazú. As a result, I thought this would be a good time to share a fun volcano craft we did a few months ago. The Monkeys and I actually did it for my husband’s birthday, but it would also work perfectly for Mother’s Day or Father’s Day. It’s easy to do with one child but also makes a great keepsake for siblings, as shown here. We used red and yellow paint for the lava. Red had the best effect, although yellow turned out okay on the white paper. If you are doing two or more kids, be aware that the yellow will not show up very well on top of the red, so it is better to either separate the hand prints a bit or do both in red. Later in the day I painted Baby’s little hand and did my best to do a hand print with them. He really had fun with the paints! Finally, I added the mountain below so that the hand prints look like lava exploding out of the volcano. An older child could also do this step. (Monkey was “too busy working” with his legos at this point so suggested that I do it). Have an explosive day and always remember that we lava you! Father’s Day is almost here! If you are looking for a way to celebrate the special man in your life (and your child’s life! ), here is a unique and memorable gift that you can easily make in time for the big day! My husband is a wonderful father to our little Monkey. He is attentive and thoughtful and will do anything to put a smile on his little boy’s face. Such an amazing man deserves something special for his big day, even if he is too humble to expect anything. I knew my husband would love anything made by his little Monkey, and I love the idea of presents that mark the special moments in our child’s life. He is growing so quickly that I wanted to capture this precious time when he is still our little boy. 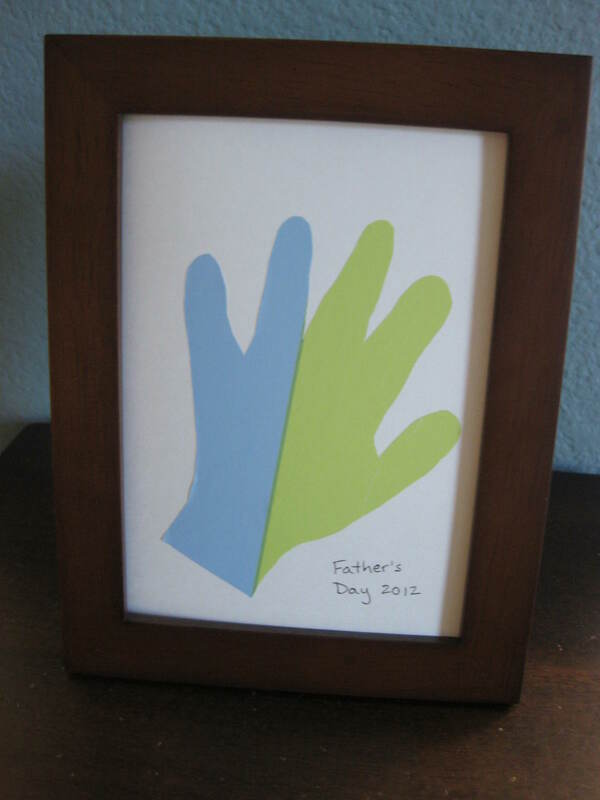 So when I ran across this amazing hand print craft, I knew I had found a winner. 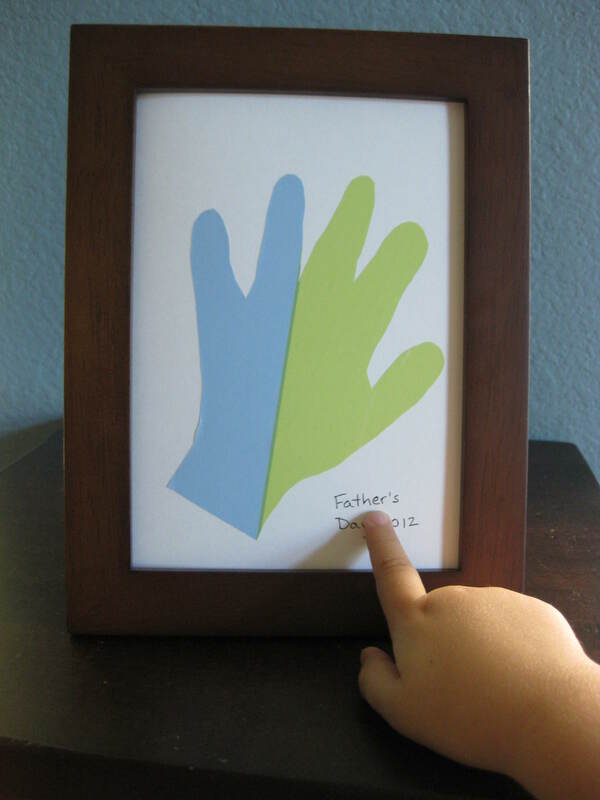 (I also love this similar hand print craft, which I will probably do once we have another little monkey running around the house). The trickiest part, of course, was getting a good hand print from my active toddler. He loves to have us “draw” his hands, but he is usually so excited that he wiggles a lot, making our drawings at best estimations. But by a stroke of luck, one day he was in just the right mood and allowed me to do a fairly accurate outline of his precious little hand. I cut this out and traced it on the back of some wrapping paper. (Next time I will probably choose a solid color or a small pattern. The wide stripes of this paper made it difficult to get exactly the look I was going for, although I was happy with the final version). I then glued this wrapping paper hand print onto a piece of poster board I had already trimmed to fit inside a picture frame. As for the frame, you can go as fancy or simple as you like. I opted for the simple – let’s call it “classic” – because I didn’t want anything that would detract from what was inside the frame. I made sure to mark the hand print with the date and later will add my little Monkey’s name. See how simple? Now we’re all ready for Father’s Day! What do you have planned for this Father’s Day?